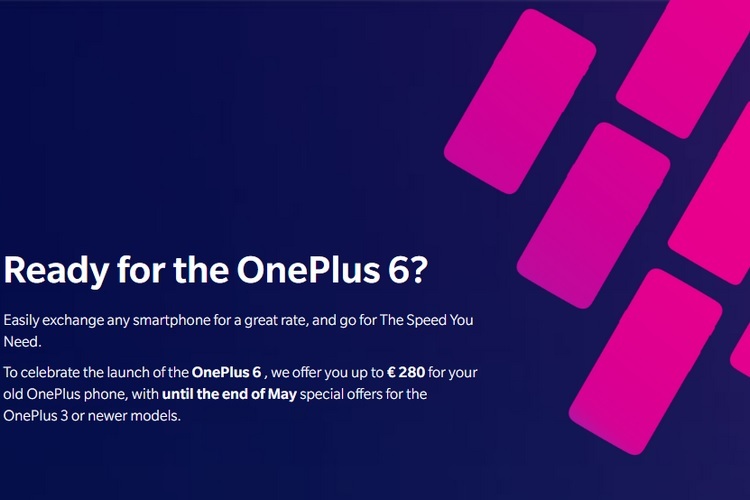 Ahead of the OnePlus 6’s launch, the company has revised its trade-in program for buyers in a number of European countries. As part of the updated trade-in scheme, OnePlus will offer exchange vouchers that can be redeemed when users buy the OnePlus 6. OnePlus will offer a trade-in discount of up to 280 euros for the upcoming flagship, however, the exchange value varies depending upon the smartphone users send for the trade-in and the device condition. The OnePlus 6 trade-in program is only available in countries where the British pound, euro, and the Swedish krona are used as official currency. As part of the updated trade-in program, users will have to sign up for the offer on the official OnePlus website, and after submitting details of their current smartphone, they have to send it to OnePlus. 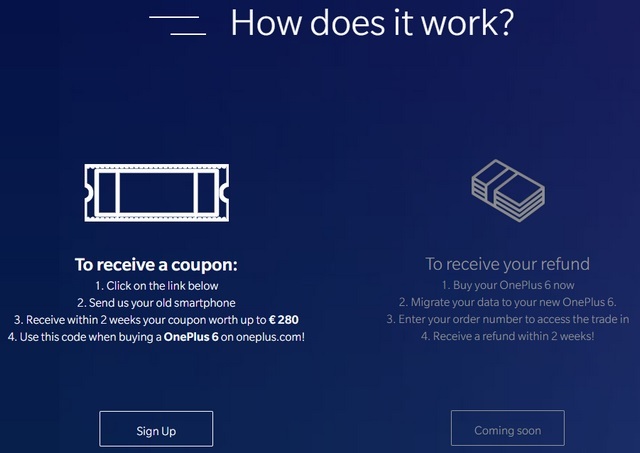 OnePlus claims that users will get their exchange voucher within two weeks of sending their smartphone, which can later be redeemed while buying the OnePlus 6 from the company’s official website. The trade-in amount will be refunded to buyers within two weeks of purchasing the OnePlus 6. The sign-up page for the trade-in program is now live. As for the trade-in value of different smartphones, a OnePlus 5T (128GB) which is in pristine condition and has not been repaired even once will net a trade-in voucher worth £204, while the Galaxy S8 Plus (64GB) and the Google Pixel 2 (128GB) will provide an exchange value of £251 and £276 respectively. It appears that new flagship devices like the iPhone 8, iPhone X and the Galaxy S9/S9+ are not eligible for the trade-in offer as they are not mentioned in the list of smartphones that can be exchanged. In addition to the updated trade-in program, OnePlus has also announced a ‘Fast AF’ sale on Amazon for buyers in India that will give benefits worth Rs. 2,000 as well as 3 months extended warranty.